For the classic film buff there can be nothing more frustrating than a relative or friend who does not share his or her appreciation of classic movies. Perhaps they have preconceived notions about classic films (too slow, too corny, et. al.). Perhaps after growing up with colour television they simply have a bias against films shot in black and white (as many of the classics were). Regardless, it seems likely that they have never seen a classic film beyond perhaps The Wizard of Oz (1939) or It's a Wonderful Life (1946). At the very least, it seems clear that they haven't seen the right classic film. Let's face it. There are those classic films that even the most stubborn modern viewer can't help but appreciate, and often those classic films will trigger a lifelong love affair with the classics. I honestly believe one of those films that could turn anyone into a classic movie fan is Bringing Up Baby (1938). Never mind that Bringing Up Baby is one of the best examples of the screwball comedy in existence. It also happens to be fast paced (much faster paced than some modern comedies) and it has some humour that is surprisingly modern for the era (with one line that got completely past the Production Code Administration). Bringing Up Baby originated in 1937 when director Howard Hawks was trying to get production rolling on RKO's adaptation of Rudyard Kipling's Gunga Din. Unfortunately Gunga Din would prove to be a problem for Mr. Hawks, who was not able to get some of the cast he wanted. Quite simply, MGM refused to lend Clark Gable, Spencer Tracy, and Franchot Tone to him for the film. Frustrated with the entire project, Howard Hawks began looking for something else to direct. He found it in the story "Bringing Up Baby" by Hagar Wilde, published in the April 1937 issue of Colliers. RKO bought the film rights for the story for $1004. As to Gunga Din, it was passed to director George Stevens and RKO released the film in 1939. Of course, it too would become a classic. Howard Hawks soon learned that the original short story's author, Hagar Wilde, lacked the experience to complete the screenplay. He then turned to Dudley Nichols, who was then perhaps best known refusing the Oscar for Best Writing, Screenplay for The Informer (1936) because the Screenwriters Guild was on strike at the time. Dudley Nichols and Hagar Wilde worked together on the script, which underwent numerous changes before its final version. As to the female lead role of Susan on Bringing Up Baby, the script was specifically tailored to Katharine Hepburn. RKO had its doubts as to Miss Hepburn in the role, primarily because it had been some time since she had a box office hit. Regardless, they agreed to the casting of Katharine Hepburn. The male lead role of David proved a bit more difficult. Howard Hawks wanted Harold Lloyd in the role, but producer Pandro S. Berman vetoed the idea. The role was offered to Leslie Howard, Fredric March, Robert Montgomery, Ronald March, and Ray Milland, all of who turned it down. Howard Hawks then turned to Cary Grant. Mr. Grant was not particularly eager to play the role, but Howard Hawks simply advised him to the play the part as if he was Harold Lloyd. In fact, in Bringing Up Baby Cary Grant even wears horn-rimmed glasses of the sort for which Harold Lloyd was famous. Some well known characters actors filled out the rest of the cast. May Robson was cast as Susan's Aunt Elizabeth. Charles Ruggles played big game hunter Major Horace Applegate. Barry Fitzgerald was cast as Aunt Elizabeth's gardener and George Irving as her lawyer. Even the dog George was played by a veteran actor: Skippy, the terrier best known as Asta in the early "Thin Man" movies. Shooting on Bringing Up Baby was set to start on September 1 1937, but would be delayed due to various factors. Before shooting began RKO had to get the rights to the song "I Can't Give You Anything but Love, Baby", which was pivotal to the film's plot. Howard Hawks also hired Robert McGowan and Gertrude Purcell to do some uncredited rewrites of the script. Robert McGowan borrowed a gag from Harold Knerr's comic strip Dinglehoofer und His Dog, which meant RKO had to pay King Features $1000 for the use of the gag. Bringing Up Baby finally began shooting on September 23, 1937. Shooting on the film fell behind in a large part because of its stars. Cary Grant and Katharine Hepburn extemporised a number of the film's lines, with the end result being that one or the other of them (and often both) would break into laughter. Howard Hawks also frequently changed the dialogue and even entire scenes. Complicating matters was the fact that Howard Hawks often took his time shooting various sequences for the film. Scheduled to be shot in five days, Howard Hawks took twelve days to shoot a scene in a jail. Scheduled to end end shooting on November 20 1937, shooting on Bringing Up Baby did not end until January 6 1938. Upon its initial release Bringing Up Baby received mostly good reviews. Unfortunately, its box office would also be somewhat disappointing. The film performed very well in such major cities as Los Angeles, Washington D.C., Cincinnati, Denver, and Portland. Unfortunately it did very poorly in both New York City and the Midwest. Ultimately Bringing Up Baby earned only $715,000 at the American box office. 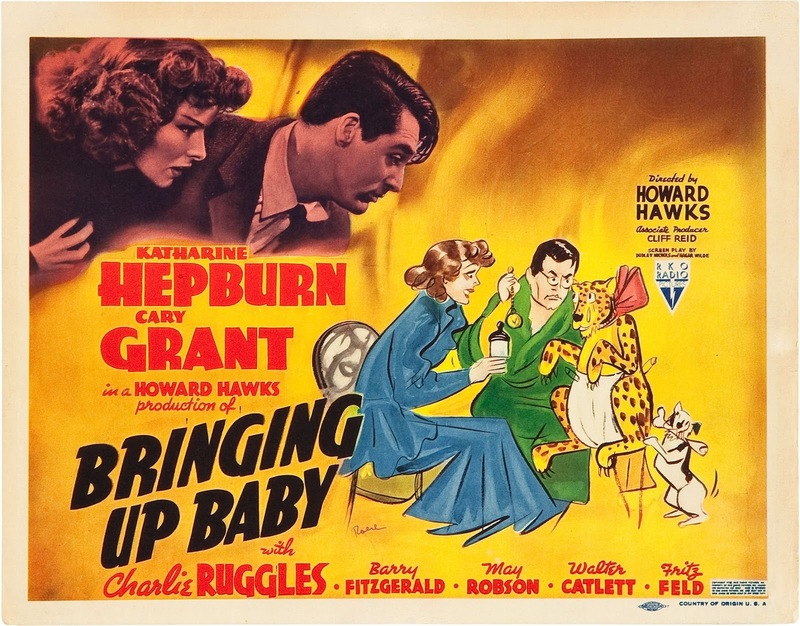 Fortunately, while Bringing Up Baby did not do well at the box office upon its initial release, the film would grow in popularity over the years. It made a small profit when it was re-released in the early Forties and grew even more in popularity when it began airing on television in the Fifties. By the Fifties Howard Hawks was being recognised as an auteur by the writers of French film magazine Cahiers du Cinema and Bringing Up Baby was being regarded as one of his classics. Today there should be little wonder why, despite a disappointing box office take on its initial release, Bringing Up Baby should become regarded not only as a classic, but by many as the quintessential screwball comedy. The premise of Bringing Up Baby is deceptively simple. Palaeontologist Dr. David Huxley finds his life disrupted by the free-spirited Susan Vance and her pet black leopard Baby. While the premise of the film is simple, its plot certainly is not. Once Susan and Baby enter David's life, complications mount upon complications, building towards the film's climax. Bringing Up Baby is fast paced, even for a screwball comedy, with gags coming so fast that one can easily miss them if he or she isn't paying attention. While the emphasis is on laughs in Bringing Up Baby, David and Susan are still fully developed characters, even if both of them are a bit left of centre. Ultimately the fast pace and large number of gags in Bringing Up Baby make it ideal for converting those who think classic films are boring or uninteresting. Even those people who "don't like black and white films" will find it hard not to resist the movie. Quite simply, Bringing Up Baby is so funny that anyone who watches it without laughing probably isn't human. Regardless, Bringing Up Baby has long been regarded as one of the greatest comedies of all time. In only the second year of the the National Film Registry of the Library of Congress, 1990, Bringing Up Baby was selected for preservation. In their initial list of the greatest American films of all time, 100 Years...100 Movies, the American Film Institute ranked Bringing Up Baby at 97 in 1998. When the list was updated in 2008 Bringing Up Baby was ranked at no. 88. The National Society of Film Critics ranked Bringing Up Baby even higher in its list of 100 Essential Films, on which it was placed at no. 14. In 1999 the magazine Entertainment Weekly placed Bringing Up Baby at no. 14 on its list of the 100 Greatest Movies of All Time. Bringing Up Baby is then not only a very funny movie, but also one that is widely regarded as one of the very best classic films. It was fifty years ago today, on December 3 1965, that The Beatles' album Rubber Soul was released. It was The Beatles' sixth album and the first two to be recorded during one, continuous period of time (from October 12 to November 15 1965, to be exact). It was only The Beatles' second album, after A Hard Day's Night, to contain completely original material. Each of their earlier albums had featured covers of songs originated by other artists. Most importantly, Rubber Soul marked a milestone in The Beatles' evolution as a band. On Rubber Soul The Beatles expanded their sound to include influences as diverse as folk rock, rhythm and blues, pop, and even Indian music. The Beatles also expanded the way in which they used various instruments. George Harrison's "Think for Yourself" featured fuzz bass. For the bridge of John Lennon's "In My Life" a piano was made to sound like a harpsichord. One song even featured an instrument new to The Beatles' repertoire. "Norwegian Wood (This Bird Has Flown)" marked the first use of Indian sitar on a Beatles' song. Of course, here it must be pointed out that, contrary to popular belief, it was not the first rock song to feature a sitar. That was "See My Friends" by The Kinks, released in September 1965. Rubber Soul also saw the maturation of The Beatles' subject matter. While Rubber Soul featured its share of love songs, they were considerably more sophisticated. Both "You Won't See Me" and "Girl" took a darker, more bitter look at love. Other songs on the album largely eschewed love in favour of other subjects. While "In My Life" makes reference to the subject, it is only in the final verse, with most of the song devoted to nostalgia. John Lennon's "Nowhere Man" was a look at a man who has "no point of view" and makes "nowhere plans for nobody". "The Word" examined love as an abstract concept. On Rubber Soul The Beatles had grown a great deal with regards to lyrical content. Given how popular The Beatles were in the Sixties (indeed, they still are), it should be no surprise that Rubber Soul hit number 1 on the UK albums chart, the Billboard albums chart, and the Australian albums chart. Of course, here it must be pointed out that when Rubber Soul was initially released in the United States, Capitol omitted the songs "Drive My Car", "Nowhere Man", "What Goes On", and "If I Needed Someone", and included the "I've Just Seen a Face" and "It's Only Love", both of which had appeared on the British edition of Help!. In the United States Drive My Car", "Nowhere Man", "What Goes On", and "If I Needed Someone" would appear on the compilation album Yesterday and Today. Rubber Soul has remained one of The Beatles' most highly regarded albums, as well as one of the greatest rock albums of all time. In 2010 Time magazine included Rubber Soul in their list of 100 All-Time Albums. In 2012 Rolling Stone ranked Rubber Soul number five on their list of 500 Greatest Albums of All Time. For myself, Rubber Soul is second only to Revolver as my favourite Beatles album. The original British version of the album also features one of my all time favourite Beatles songs. "Nowhere Man". Here, in honour of the 50th anniversary of the album, is "Nowhere Man". The Beatles - Nowhere Man from Phap Than on Vimeo. Elmo Williams, the film editor who won the Oscar for Best Film Editing for High Noon (1952) and was nominated for the same award for 20,000 Leagues Under the Sea (1954), died on November 25 2015 at the age of 102. In the Fifties Elmo Williams edited the films High Noon (1952), Hellgate (1952), The Tall Texan (1953), The Cowboy (1954), 20,000 Leagues Under the Sea (1954), Blonde Bait (1956), Hell Canyon Outlaws (1957), and Hell Ship Mutiny (1957). He served as editorial supervisor on The Vikings (1958). In the Fifties Mr. Williams moved into production with The Cowboy (1954). He served as an associate producer on the syndicated television series Tales of the Vikings. He became a director with The Tall Texan in 1953. In the Fifties he directed the films The Cowboy (1954), Women Without Men (1956), Blonde Bait (1956), Apache Warrior (1957), and Hell Ship Mutiny (1957). He also directed episodes of Tales of the Vikings and served as a second unit director on The Vikings. In the Sixties Mr. Williams did uncredited editing on Cleopatra (1963). He served as a producer on The Blue Max (1966) and Tora! Tora! Tora! (1970). In the Seventies Elmo Williams was Head of Production for 20th Century Fox from 1971 to 1977. He served as a producer on the films Sidewinder 1 (1977) and Caravans (1978). In the Eighties he produced the films Soggy Bottom, U.S.A. (1981), Man, Woman and Child (1983), and Ernest Goes to Camp (1987). In 2006 Elmo Williams published the book Elmo Williams: A Memoir. Elmo Williams was a gifted film editor, perhaps one of the greatest of all time. The movie High Noon simply would not have worked with out his skilled editing, which enhanced the tension in both the script and Fred Zinnemann's direction. His prowess at editing was also on display in 20,000 Leagues Under the Sea, which arguably deserved to win the Oscar for Best Directing. He edited films in such diverse genres as Westerns (The Tall Texan), dramas (The Miracle of the Bells), and film noir (Nocturne). Even when the films might not have been that good, Elmo Williams's direction was always excellent. As hard as it may be for many of us to believe, Woody Allen's career goes back seventy years. It was in 1955, when he was only 19 years old, that Mr. Allen joined the NBC Writer's Development Programme. He went on to write for The NBC Comedy Hour, The Ed Sullivan Show, The Tonight Show, Candid Camera, and The Pat Boone Show. He began a career in stand-up comedy in 1960 and in 1966 he wrote the play Don't Drink the Water. The year 1966 saw the debut of Woody Allen's fist film, What's Up, Tiger Lily?, which was simply the Japanese spy film, International Secret Police: Key of Keys overdubbed with dialogue written by Woody Allen. In 1969 Take the Money and Run, the first wholly original film directed and written by Woody Allen, was released. Since that time Woody Allen has become both a critically acclaimed filmmaker whose influence has been felt on more than one generation of directors. 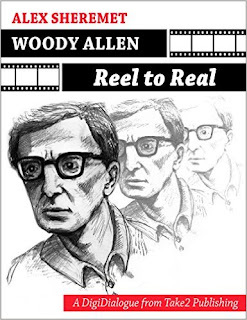 There have been several book written on Woody Allen's films, but none are as comprehensive as Woody Allen: Reel to Reel by critic, poet, and novelist Alex Sheremet. Mr. Sheremet examines every single film ever made by Woody Allen in depth. In Woody Allen: Reel to Reel Woody Allen's works are dissected to a degree that they have never been before. Alex Sheremet even includes Woody Allen's thoughts on his own films, career, and his life. Quite simply, Woody Allen: Reel to Reel covers a good deal of ground that has never been covered before. As if this was not enough, Woody Allen: Reel to Reel is further set apart from earlier works on Woody Allen's films by the fact that it is a DigiDialogue. To quote from DigiDialogue.Net, a DigiDialgoue is "a process and a product that results with a published eBook where the dialogue between the author and the audience becomes part of the final ‘copy’." Alex Sheremet's analyses of Woody Allen's films are then punctuated by comments from his readers on his website at http://www.woodyallenreel2real.com. From time to time, then, Woody Allen: Reel to Reel will be updated with more comments, offering readers the chance to give their own views of Woody Allen's films and career. With Woody Allen: Reel to Reel Alex Shermet has made a remarkable achievement. What is more, it is not simply in the breadth of his work. With every analysis of every film Mr. Sheremet gives sound reasons for his views, going in depth on his opinions of various Woody Allen films. One might sometimes disagree with Alex Sheremet on his opinion of any given film (and I occasionally found myself doing so), but he or she can understand the basis of Mr. Sheremet's views of any given film and as a result he or she can respect them. Unlike many critics, he does not simply say, "I don't like this film", and give no sound reasoning for doing so. Here it must be pointed out that Alex Sheremet goes beyond analysing Woody Allen's films. He has an entire chapter devoted to films in which Mr. Allen only appeared as an actor (such as 1967's Casino Royale and 1976's The Front). He also has a chapter devoted to Woody Allen's critics in which he analyses their criticisms and discusses where he agrees or disagrees with him. The final chapter deals with the influences on Woody Allen's works. Woody Allen: Reel to Reel is an remarkable accomplishment on Alex Sheremet's part. It is the most in-depth work ever published on Woody Allen's works and career. It is definitely a must for any fan of Woody Allen's films or anyone wishing to learn more about them. Tomorrow is December 1. Not only is it the first day of the month in which Christmas Day falls, but it is also the day when many of us are finally in the mood for holiday movies. 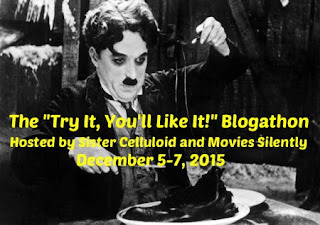 With the many cable channels today there is ample opportunity for classic film buffs to see their favourite films. Of course, as might be expected, the bulk of them air on Turner Classic Movies. In fact, TCM has dedicated Friday nights primarily to Yuletide films. Here I should talk a little bit about the movies included in this guide and the guide itself. First, I have included only those films I consider Christmas movies. It is for that reason that I don't include films like Little Women or Meet Me in St. Louis (although I do love the latter film), even though they are shown frequently at this time of year. Second, I generally only consider a film a classic after it has been around thirty years. Quite simply, I think a movie has to have stood the test of time before it is considered a classic. That having been said, I know some people might consider films classics after shorter periods of time (say, twenty or even ten years), so I have included some more recent films here too. Of course, in those instances I have only included those films that I think might one day become classic (which is why you don't see Christmas with the Kranks on this list). Third, I have listed the films by the cable channels or networks on which they are airing. Fourth, all times are Central, so if you live in another time zone you'll want to adjust the times accordingly. Fifth, I won't claim this list is complete, as I know I've probably missed some films and even entire channels. I also have to point out that AMC only has their schedule up for the next two weeks, They probably will show Miracle on 34th Street again later in the month (and in glorious black and white at that). They have in past years. Here I have to give a shout-out to GetTV. While GetTV is not showing any holiday films this year, they are showing a lot of classic Christmas variety television specials, including Bing Crosby and Andy Williams specials. I also have to give a shout-out to MeTV, who is showing classic Christmas episodes of TV shows. And, of course, the ABC Family Channel is showing a lot of the classic Rankin/Bass holiday specials. If you're a fan of classsic TV, there's a good deal for you to watch this month! Without further ado, here's my holiday movie guide. I'm starting off with Turner Classic Movies, as they show more Christmas movies than any other. A Christmas Story 7:00 PM (and for the next 24 hours as well).